December 31st ended with another turning of night into day, but our calendar tells us that this new day is also a new year, and it’s a chance to think about the coming seasons and do some planning to expand our minds, our limbs, and our relationships. Do more of what I love: Nordic skiing; ocean rowing; working on an organic farm; biking for fun & transportation; entertaining at home and canoeing with my husband. Pick up something I used to enjoy, and try it again: play squash; run. Drop what is no longer fun: downhill skiing; laundry. Dabble in new curiosities: draw; skate ski; keep a nature journal; tend goats and learn to fish from my son. Commit to something a little daunting: spend the summer on an island; run the Millinocket half marathon. 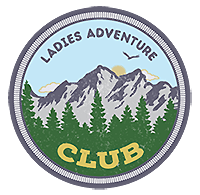 The Ladies Adventure Club will be a big part of my year, and I’m excited for the experiences and the relationships we will develop. Send a note with your goals and Gillian and I can try to develop them into an LAC adventure. Farmer for a day? Squash clinic? Bike tour? Fly fishing in waders? Need a nudge? Gillian and I welcome you to join us for the Millinocket Marathon & Half Marathon December 8! I was inspired by a friend who competed this year with a compelling strategy: run 5 minutes, walk 2 minutes, repeat… her group completed the 13.1-mile race together, pain free and in the middle of the pack. This race is FREE, and designed to be an economic boost for the region. Registration is open, and accommodations are filling rapidly. And two women just had to withdraw from the Grand Falls ski trip February 3-4, so space is available for you (and a friend?). Let’s help each other replace “I should” with “I will….” I’m eagerly anticipating adventurous encounters with you in 2018.